For many years, companies have been forced to search for third party contract laboratories to fulfill their analytical needs. This practice is costly, labour intensive, and does not guarantee expert laboratory services. Let Krins Life Sciences do the searching for your business. With an extensive network of laboratory partners, and agreement in place, Krins can connect you with laboratories in North America and all around the world. Whether analyzing pharmaceutical, cosmetic, or nutraceutical products, Krins has a lab for every business. Need more help? 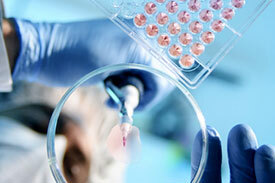 Krins Life Sciences can also manage entire project for you on your behalf. Set a deadline, and our industry experts can complete your project from start to finish. Krins Life Sciences and their allies have an extensive range of analytical resources, in a variety of disciplines. These disciplines include veterinary medicine, chemical and disinfectants, and food industries. Krins Life Sciences is committed to protecting the confidentiality and safety of clients. All partners are subject to a confidentiality agreement, to ensure the protection of clients IP’s. Our partner labs are Health Canada Licensed, and USFDA accredited. 5. Microbiological test such as Microbial count (Total Microbial count, Yeast and Mould count)by USP and other official methods, Preservative efficacy test, Sterility test and Endotoxin test , Particulate count etc.